Fast declining moral values, root cause of corruption, immorality. Udupi, Dec 13, 2015: Justice N. Santosh Hegde, the former Lokayukta, said on Dec 12, Saturday that the rapid decline in moral values was the reason for the increase in corruption, immorality, greed and lack of ethics in the country. 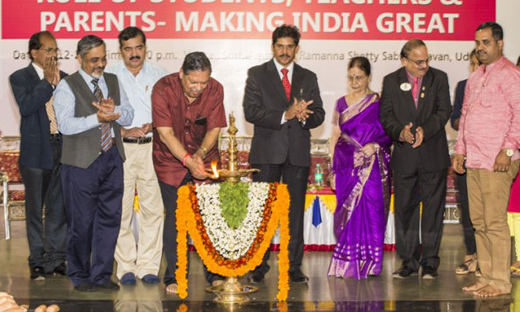 Speaking at a symposium on ‘Role of students, teachers and parents – making India great’ organised by Bunts’ Sangha, Premier Institute of Placement and Research Centre and Lions Club. Justice Hegde said that the level of corruption in the country, which was low when it got Independence, had increased drastically later on. The Commonwealth Games scam and the 2G spectrum scam showed the exponential increase in corruption. A disturbing aspect was that the society’s attitude to corruption too was changing. A few decades ago, a corrupt and unethical person was shunned. But now their presence was not just tolerated, but was regarded as desirable. “When corrupt persons to go to jail now, their followers make a display of immense sadness and when they come out of jail, it is celebrated and sweets are distributed,” he said. Stating that the Lokayukta was a good institution, Justice Hegde said that the Lokayukta was created by the State government in 1984 not only to curb corruption but also to respond to grievances of people who had to face administrative apathy. “Till 2015, not a single individual could point a finger at the institution of Lokayukta,” he said. The functioning of the legislature too had left a lot to be desired. Parliament had been unable to transact any business for the last four days over the National Herald issue. Crores of rupees are spent a day on Parliament sessions. They were being held hostage to a few political issues over long time frames. The situation remained the same, whichever government came to power. The state of the media in the country was best illustrated by the Nira Radia tapes. Paid news had put paid to the credibility of the media.